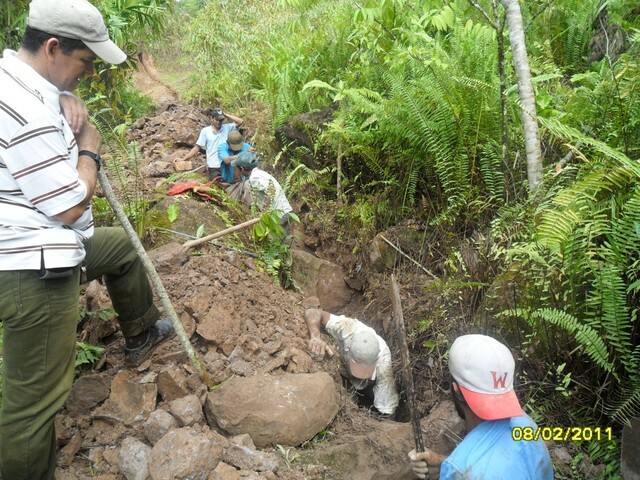 In the Palan Buena Vista community, a gravity water project delivering 70 liters/day per inhabitant and a latrine to individual houses, education for maintenance, long term hygiene and sanitation, the preservation and reforestation of the watershed. 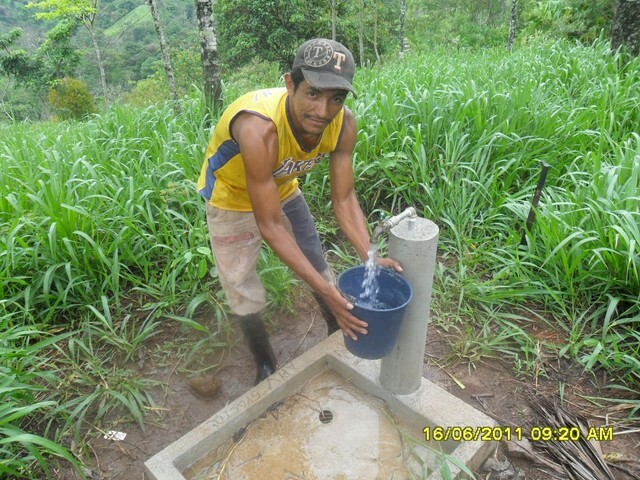 The water supply and sanitation project in the community of Palan Buena Vista, Municipality of Rio Blanco, in the department of Matagalpa is a gravity flow system that is benefiting 19 families. 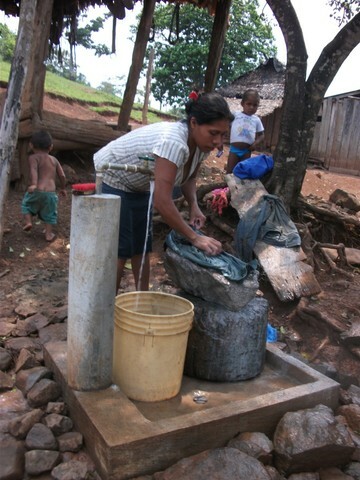 The system is fed by a spring that is located near from the community. 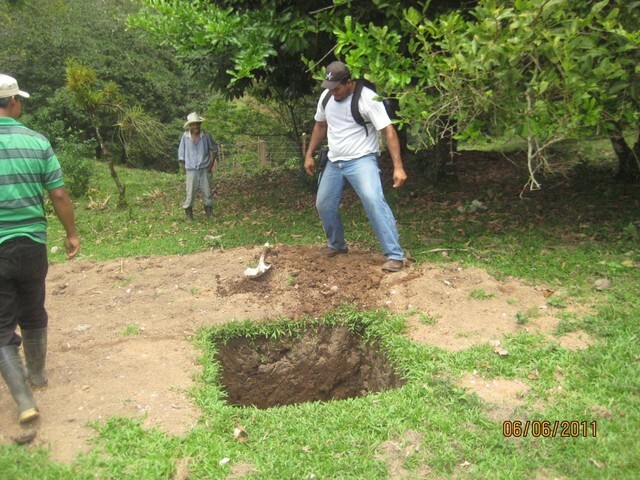 In order to receive donation of the area of the main spring, the community and APLV had to accept to give water to the owner of the spring. 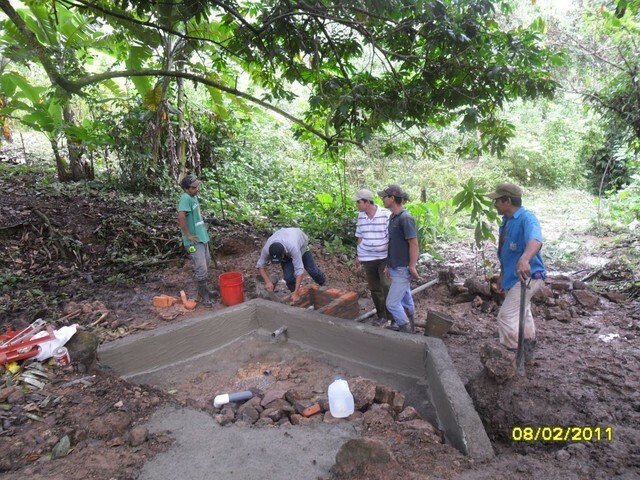 For this purpose a second spring have been found upwards, and a small water system has been built to provide with water the owner. 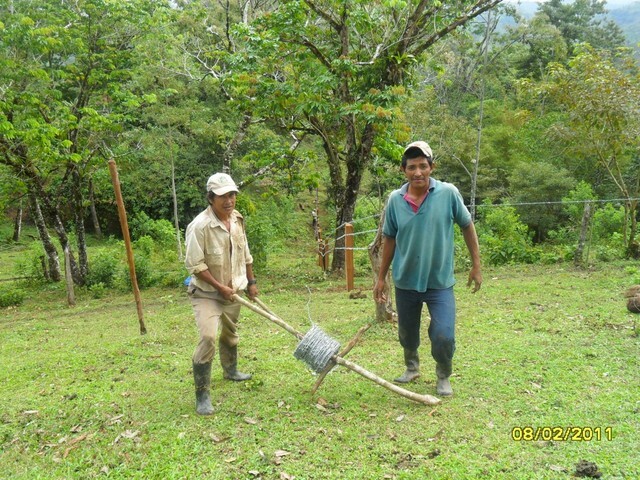 With this, the spring owner gave to the community an area of 0.4 ha around the spring. This main spring capture is constructed of simple brick and mortar, has an internal filter of rock and sand, a collection box with a metal lid for inspection, and an inspection cover for the filter. The main conduction line starts at the spring and consists of 1434 meters of PVC pipe (a combination of 1” SDR 26, 3/4" SDR 17 and 1/2" SDR 13.5). It has a capacity to of 112 liters of water per minute. The other conduction line (for the spring owner) is 156 m long. There are two storage tanks. The small one (for the owner of the spring) is 1.1 cubic meters. The main storage tank has a capacity of 5 cubic meters. For accessibility reasons, both tanks are Rotoplast tanks (cylinders of plastic), protected from the sun and rain, inside a kind of wooden hut. The trench is being dug one meter deep, with the aim of ensuring greater durability to the pipeline and therefore lower the maintenance cost for the community. 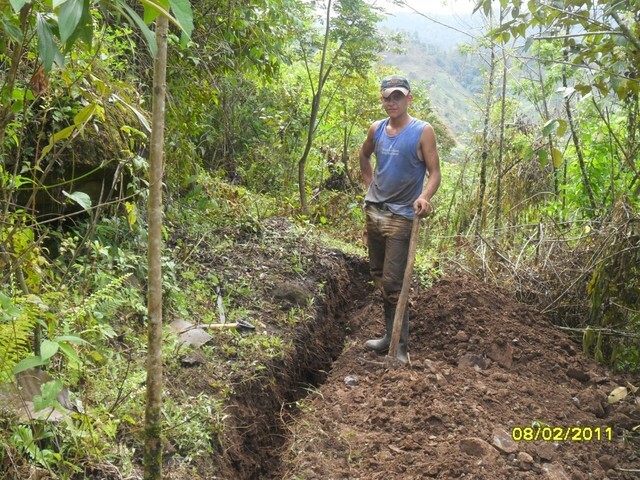 In total 3477 meters has been excavated, pipes going from 1/2" up to 1 1/2" have been installed. 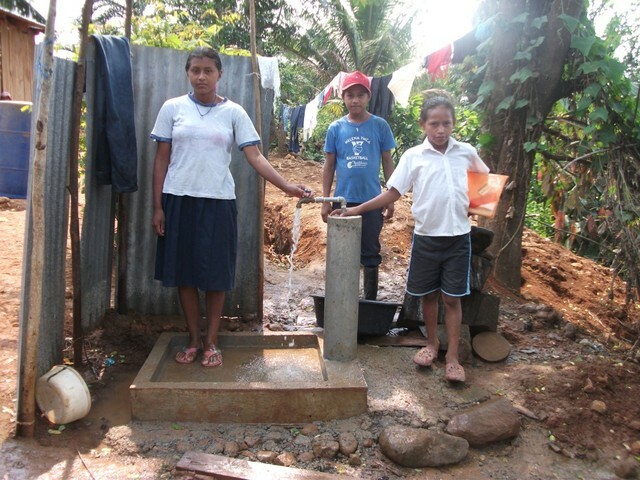 21 water-stands have been constructed : 19 in the houses of the people, one in the school and one in the evangelist church. Every house is equipped with a water-meter. Every family pay a fixed quote per month (see below). 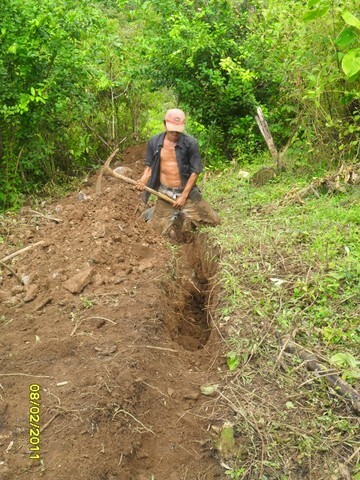 The beneficiaries participate in whole work, by digging and carrying materials. It represented 70 days of work for each family. 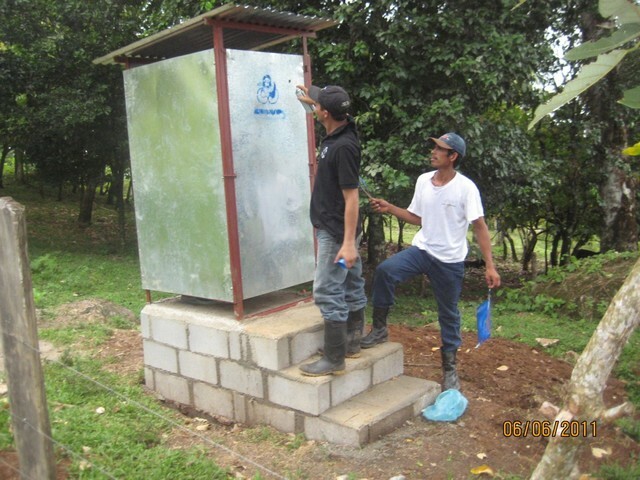 19 latrines have been constructed. 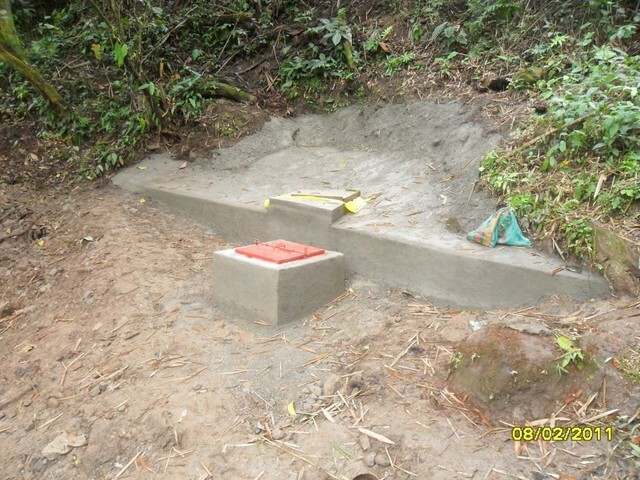 One model latrine has been constructed by APLV mason. 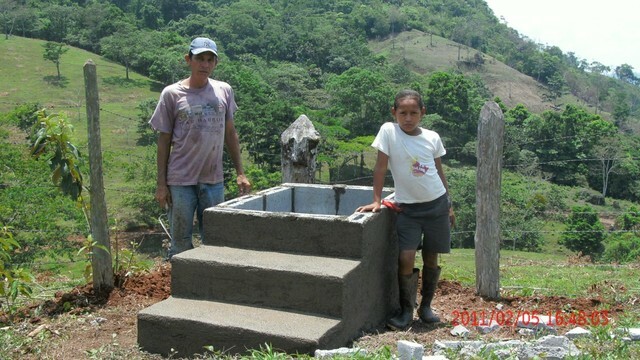 Each family received the material and they constructed their own latrine. 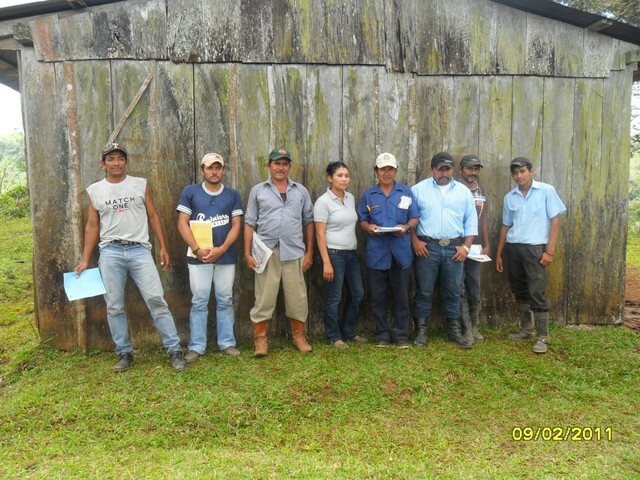 • Legalization of easements and agreements with the owners of the spring and the tank area. • Ensure the logistics for the APLV staff during the execution of the project. • Home visits to encourage family participation. • Two training session with nine members of the Water Committee with the themes of responsibilities, functions and leadership. 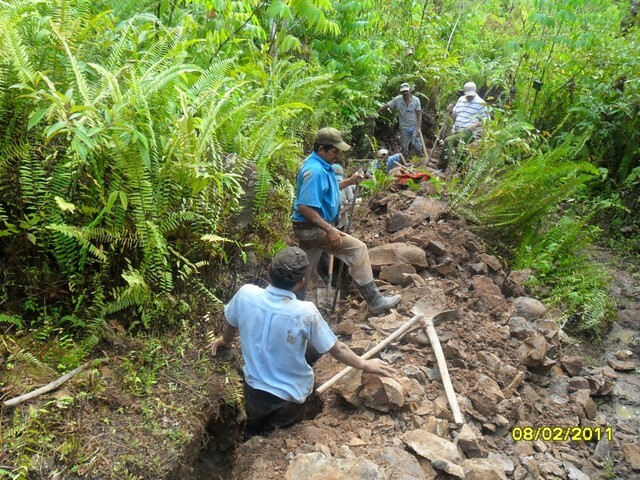 • Four meetings with the Water Committee to assess progress of the work. 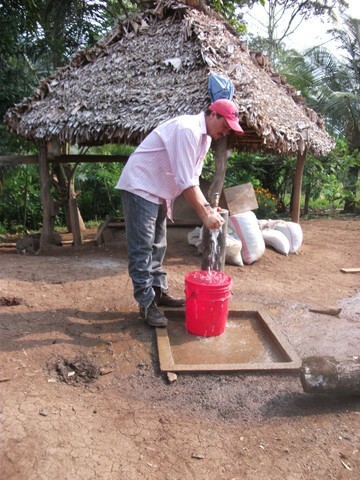 --> Before project : spring water quality = 6 CFU of coliforms / 100 ml. • A workshop for the 19 families on solid and liquid waste. 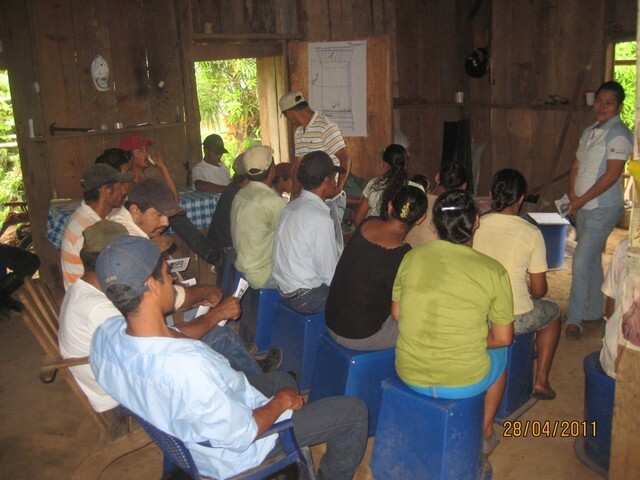 • Workshop with the whole community on health monitoring system and water-borne diseases. 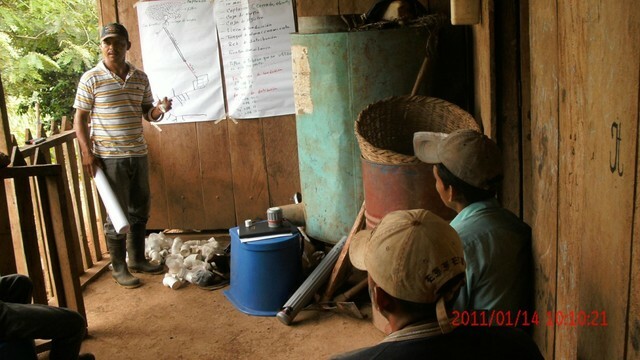 • Three training sessions with beneficiaries on use and management of water, personal hygiene and food hygiene. 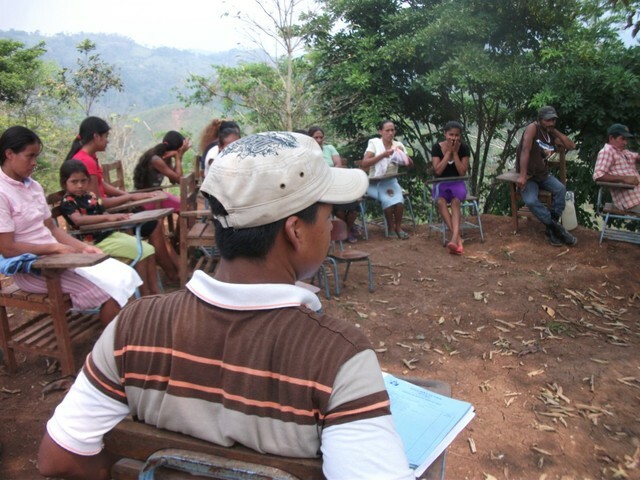 • Four training sessions with students on school and environmental hygiene, water use, food hygiene and household sanitation. • Two home visits to follow up on the guidance given in trainings and lectures. The 0.4 ha around the spring has been surrounded with barbed wire. The owner of the area accepted to surround also an extra area of 1.25 ha. These two areas are now free of cows and horses, which prevent water contamination. 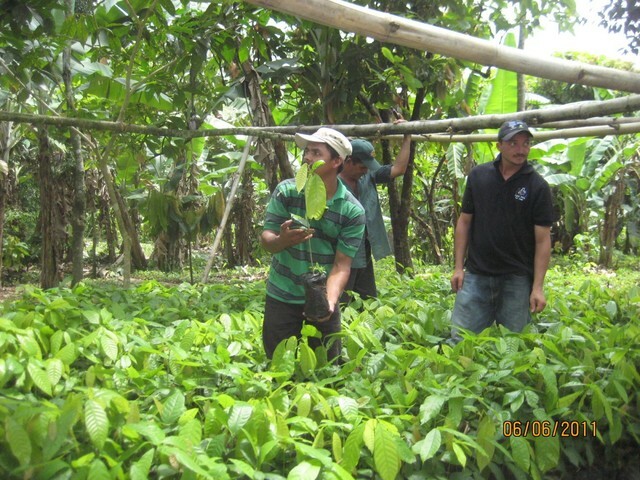 The forestation program learn to some beneficiaries how to do a tree nursery. 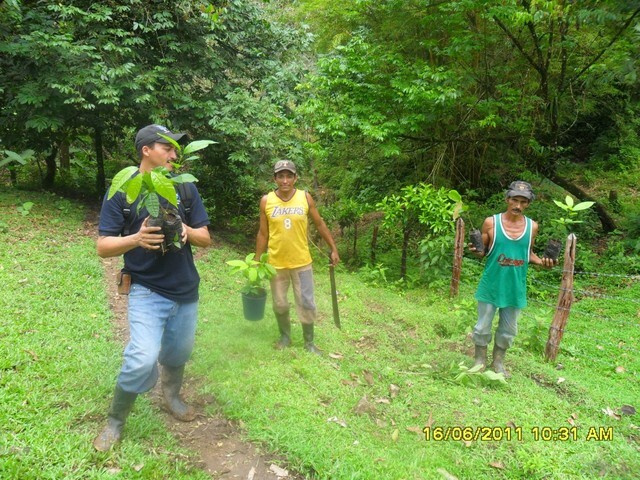 2500 trees have been grown up and planted in the two areas around the spring. 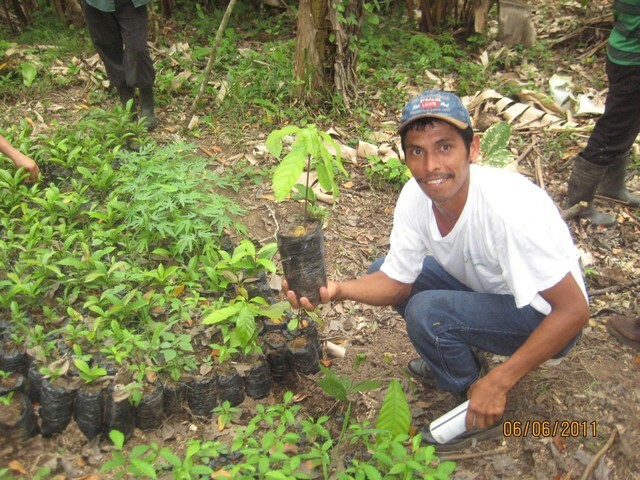 Trees selected were : cacao tree, peer tree, guanacaste, bimbayan. 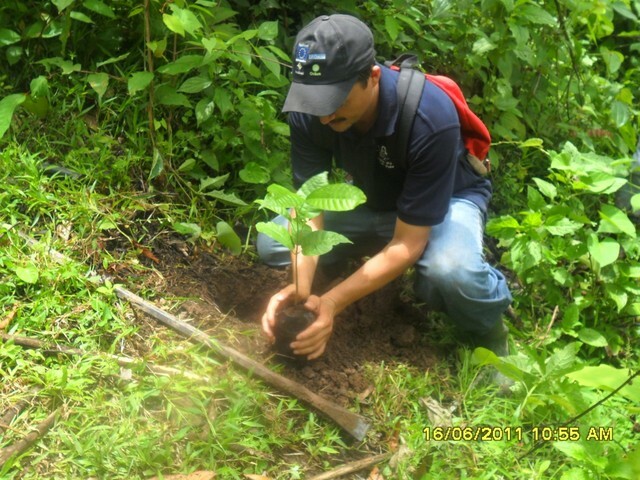 • Two training sessions with the beneficiaries about how to preserve a watershed and how to grow up a tree nursery. The Drinking Water Committee was formed early in the process of assessing this project and has remained organized and has demonstrated leadership in the community. 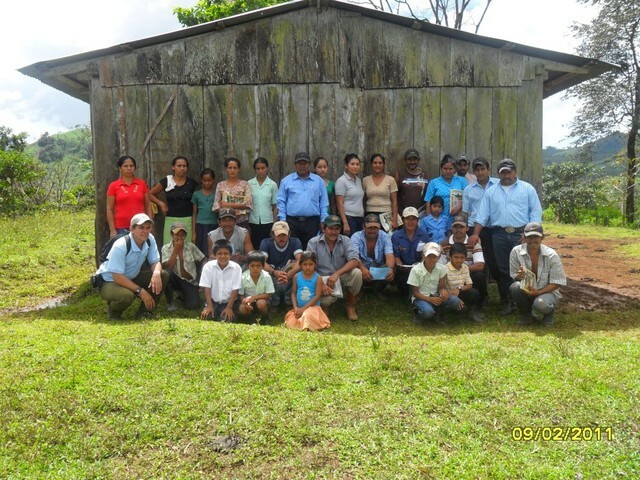 The creation of this committee is a key element in ensuring the sustainability of the project. The committee members received training in management, administration, maintenance, watershed management and efficient use of the water resource. Every house is equipped with a water-meter. Every family pay a fixed quote per month (around 1.5 U$) for a maximum volume of 13 cubic meters. Above 13 m3, each extra cubic meter is charged 0.25 U$. This money is managed by the Water Committee and is used exclusively for the maintenance of the system. 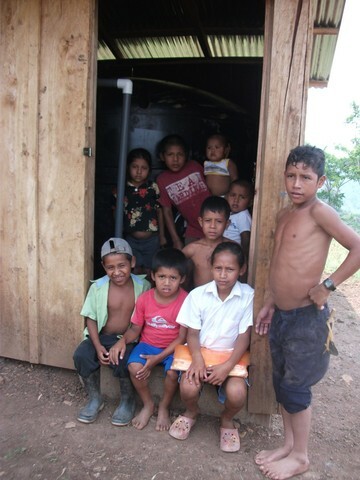 The objective of the Health and Hygiene Education Program is to guarantee that the families of the community receive the maximum possible benefit from access to clean water and sanitation. The APLV team worked directly with families and school children on personal hygiene, gender issues, latrine maintenance, food handling, trash management and water conservation. 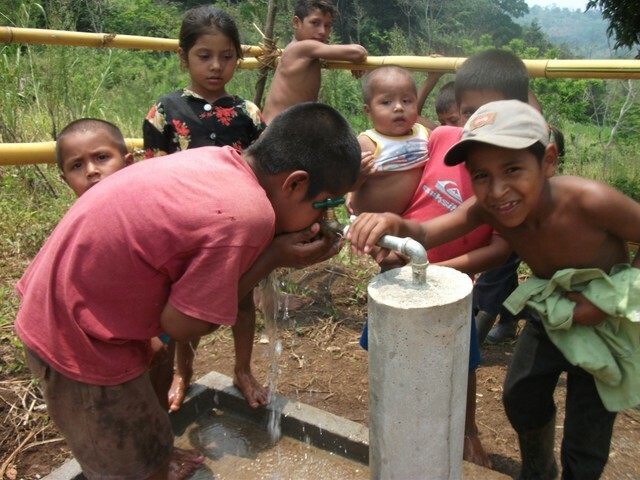 Finally, Agua Para La Vida has been working with rural Nicaraguan communities for over 25 years. Our long-term presence in the region enables us to maintain contact with our partner communities to provide on-going assistance. went to an agreement with the community. After that the project could be executed correctly. 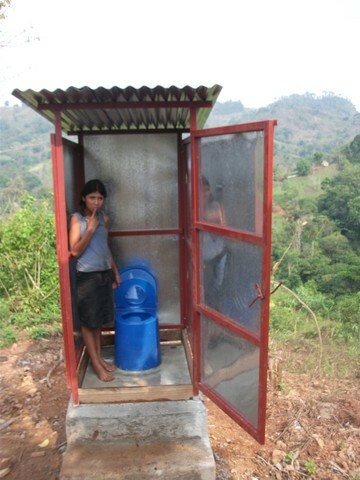 The water system has been designed and built in order to provide water to 248 beneficiaries for the next 15 years.